A remote Siberian town with a darkly fascinating history teems with life in this luminous linked debut collection. 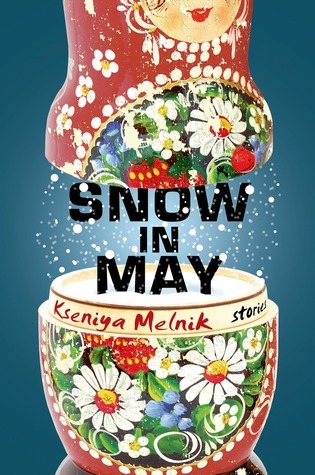 Kseniya Melnik's Snow in May introduces a cast of characters bound by their relationship to the port town of Magadan in Russia's Far East, a former gateway for prisoners assigned to Stalin's forced-labor camps. Comprised of a surprising mix of newly minted professionals, ex-prisoners, intellectuals, musicians, and faithful Party workers, the community is vibrant and resilient and life in Magadan thrives even under the cover of near-perpetual snow. By blending history and fable, each of Melnik's stories transports us somewhere completely new: a married Magadan woman considers a proposition from an Italian footballer in '70s Moscow; an ailing young girl visits a witch doctor's house where nothing is as it seems; a middle-aged dance teacher is entranced by a new student's raw talents; a former Soviet boss tells his granddaughter the story of a thorny friendships; and a woman in 1958 jumps into a marriage with an army officer far too soon. Weaving in and out of the last half of the twentieth century, Snow in May is an inventive, gorgeously rendered, and touching portrait of lives lived on the periphery where, despite their isolation - and perhaps because of it - the most seemingly insignificant moments can be beautiful, haunting and effervescent. Two things attracted me to Snow in May when I first heard about it: the absolutely gorgeous cover and the fact that it's set in Russia. Earlier this year, I read and loved The Bronze Horseman and Tatiana and Alexander, which are set in Russia during WWII. I realized while reading them that I didn't know very much about Russia. I'm often drawn to novels set in places like England or France, so I'm not that knowledgeable about this country's troubled history. As nerdy as it sounds, I truly enjoy learning. School may not always have been fun, but I love the process of discovering more about the world, about other people, about certain topics, etc. The combination of those two Russian reads and the recent Winter Olympics in Sochi left me craving more books set in Russia. So, you can imagine how excited I was when I discovered Snow in May! I'll be honest - I'm not sure if I've ever read a collection of short stories before. I know I've read individual short stories, but I don't think I've sat down and read through an entire collection of them. The coolest part of Snow in May, particularly as my introduction to short story collections, is that all of the stories are linked together. They are set during a wide range of years, not arranged in chronological order, and focus on different characters in every story. But some of those characters are connected to each other - in large and small ways - and it was so delightful to read and keep an eye out for those ties. The largest connection between all of the stories is the setting: Magadan. This port city in Russia has a complicated, bleak history. Magadan "served as a major transit center for prisoners sent to Stalin's labor camp," and those labor camps "exploited more than 2 million prisoners and exiles" (RT News, 11/09). I'd never heard of the city before, but I think the sense of place is Snow in May's greatest strength. The writing is lovely and the stories are intriguing, but the setting itself just comes to life through Melnik's words. The harsh weather, the bleak past, and the complexity of its residents are captured expertly by this debut author. While the characters themselves weren't a defining quality of the book for me, I felt like Melnik captured the truth of the human condition. She portrays the sorrow, the joy, the anxiety, the fear, the dissatisfaction, the disappointment, the hope... The tone itself is pretty somber, but I felt that it was fitting. It's not really a happy read, but I was still able to enjoy the experience of reading these stories. Melnik was born and raised in Magadan until she immigrated to Alaska at age fifteen, and her familiarity with the place and subject made these stories seem uniquely Russian. "I think this whole book is a way of reconciling my happy childhood memories with a more complex reality," Melnik said in an interview with NPR. As a reader, I could absolutely sense this tension in her stories! Focusing on the small, every moments in a life, Melnik is able to show how a place can influence the significance and meaning of those moments. For me, it made for fascinating reading. I haven't read anything quite like Snow in May before, and I don't know that anyone else would be able to replicate what Melnik has done in these stories. I didn't love every single story, but I was still glad to have read about this complicated place and glimpsed the struggles of these fictional people who represented the reality of life in Magadan. "She stood, pelting the backs of fellow line standers with all the anger and frustration accumulated in her line-standing life... She understood that bananas would have a relatively small impact on the bright future she hoped for her sons. Yet, their future would begin when she returned home, and she had the power to make it a little sweeter. Gradually, the romantic kite of her soul descended back to her body. She felt tired and overdressed. Like herself." *I received a copy of this book from Henry Holt in exchange for an honest review. I was not compensated in any way for my review. I really love the cover of Snow in May! I also like that it's about a part of Russia, because I'm very fascinated by Russian history and culture. Sometimes, it can be really interesting to read an author's portrayal of a place or a culture too, especially when done well. Glad this became a good reading experience for you! I also love the cover of this one. A matryoshka doll as a snow globe?! Genius, and adorable! I too am really interested in Russia, I think because the culture seems so unique - like a blend of European and Asian in some ways. I took a European History course this year and I loved the parts where we focused on Russian history, including the revolutions. Unfortunately we didn't go in depth so now I just want to read MORE about it all. I think it all started when I first watched the Disney Anastasia movie as a kid - my sister and I were obsessed with the soundtrack. (And the Winter Olympics definitely exacerbated my love for this country!) Anyyywayyy... I'm not sure this book is right for me, but I definitely want to know more about Russia. I may just have to give The Bronze Horseman a try! P.S. Sorry for that ramble-y comment!